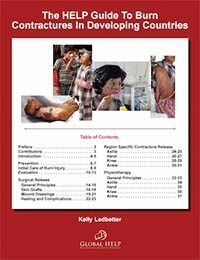 After an educational and volunteer work-stay at the Hospital & Rehabilitation Centre for Disabled Children (HRDC) in Banepa, Nepal, Kelly Ledbetter, Global HELP's first scholarship candidate, successfully authors a book about burn contractures and their treatment in the developing world. From the text: In developing countries, burn injuries are very common in children, particularly infants and toddlers. Toddlers are frequently burn victims because they are too young to judge the danger of fire and are relatively uncoordinated. Burn victims typically come from poor families in rural regions, where fires are necessary for daily living and primary care is practically nonexistent. A burn contracture is an area of skin that has undergone excessive scarring as a result of healing from a deep burn injury. The longer it takes a burn injury to heal, the more likely it is a burn contracture will form. More specifically, burns needing longer than 3 weeks to heal are more likely to produce unsightly hypertrophic scars and form contractures. As a result, patients who do not receive care shortly after they are burned are more likely to develop contractures. The best way to prevent burn contractures is to prevent the original burn injury. There are several simple measures that could drastically reduce the number of children exposed to open flames. The key is education. Indonesian translation by Robertus Arian Datusanantyo.